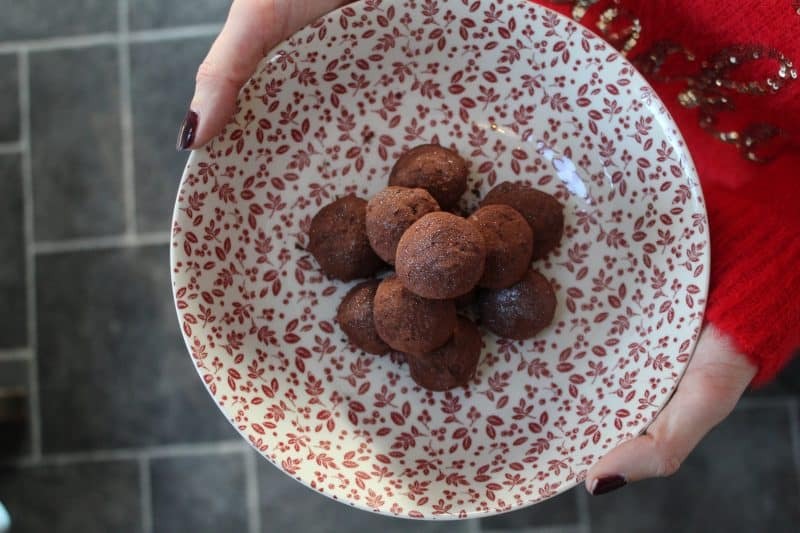 If you’re planning on dishing out some homemade Christmas presents, these gluten and dairy free Christmas pudding truffles are perfect! They’re quick and easy to make, use only three ingredients, and look super impressive too. What more could you want from an edible gift, right? My lovely friend Lauren was back from Canada the other week and for old time’s sake, we decided to have a go at some festive baking! Except, there isn’t actually any baking involved in these truffles, so maybe we’ll call is festive making! We used to always make handmade Christmas presents for each other as kids so it was a bit of a blast from the past making these! Needless to say, these gluten free Christmas pudding truffles did not last long! Once chilled they were scoffed pretty quickly – though some didn’t make it as far as the fridge! Neither of us are HUGE Christmas pudding fans but there is something about this recipe that is so moreish! 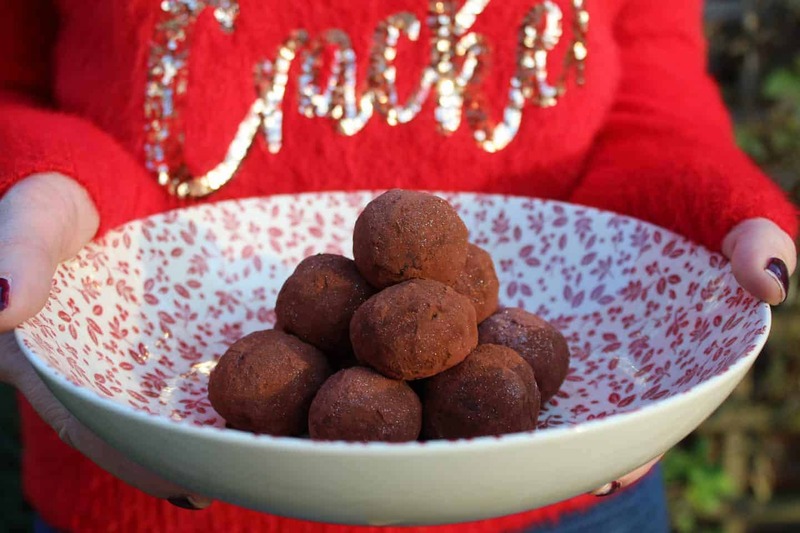 We nicknamed these truffles ‘reindeer poo’ – perhaps not the most appetising, but if you wanted to take out the rum and make them with the kids, it would be a fun pre-Christmas activity! Just make sure the Christmas pudding cools enough before you shape them into balls so you don’t burn your fingers. Pick the right Christmas pudding, and these beauties are gluten and dairy free. There is plenty of pudding choice in all the free from aisles, even in Lidl and Aldi, so you could make these pretty cheaply. How many you make depends on the size of them, but I think we made around 20 in total, and they were probably about the same size as a Ferrero Rocher. If you made some cute little boxes and lined them with greaseproof paper they would make a lovely Christmas gift! Of course the edible glitter in these truffles is optional, but it really does add a cute little sparkle. If you prefer something a little sweeter than cocoa powder, you could melt some extra dark chocolate and roll them in that once they have set. Leave them to chill and then scoff the lot! 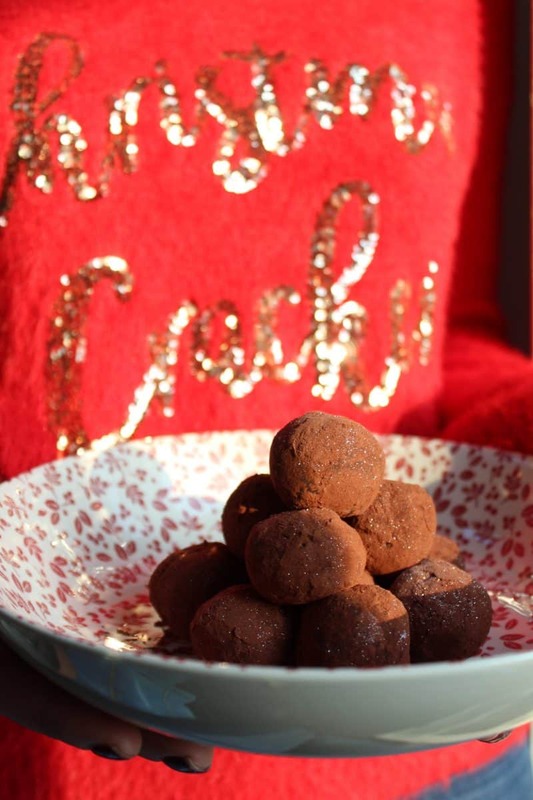 These gluten free and dairy free Christmas pudding truffles make great home-made Christmas presents, or are perfect for using up any leftover Christmas pudding! Cook the Christmas pudding as per the pack instructions - I opted to do this in a microwave as it's quicker. Meanwhile melt the dark chocolate in a separate bowl. Pour the chocolate onto the cooled Christmas pudding and add the rum. Mix well. Leave to cool for a couple of minutes, and as it cools it will start to thicken and become more malleable. Shape the mixture into little balls and, if desired, roll in the cocoa powder. Chill in the fridge until set and then devour them! If this recipe has got you feeling festive, I have plenty more inspiration for you! Check out the Christmas section of my blog, or why not give these recipes a whirl? Oh – and don’t forget to check out my 10 things that happen to gluten free people in the build up to Christmas for a giggle too. How many can you relate to! ?